For Immediate Release: Posted On 8/17/2007 By Industrial Magnetics, Inc.
Industrial Magnetics, Inc. is now offering a middle-weight contender to their Permanent Ceramic lifting solutions in their Creative Lift Line. In order to fill the gap between the CL1500 (1500 lb. maximum capacity) and the CL3000 (3000 lb. maximum capacity) IMI is now offering the CL2200 which will lift up to 2200 pounds. With the addition of the CL2200, IMI now offers five Creative Lifts, with lifting range capacities from 400 to 3000 pounds. 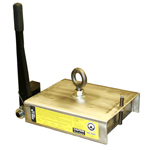 Still featuring the non-marring, Roller Cam Release for easy release of the magnet, the Creative Lift CL2200 is a great tool for thick, non-flexing plate steel. For more information, or to receive IMI’s NEW Material Handling Catalog, visit their website: www.magnetics.com or call them today, at 1.800.662.4638.